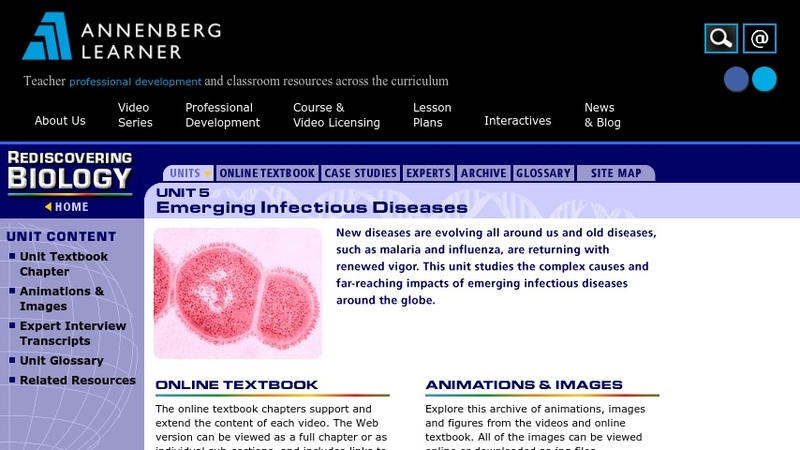 This page is the jumping-off point for an educational unit on emerging infectious diseases. There are links to a course outline and classroom activity worksheets, a 30-minute video, an online textbook chapter, a collection of relevant images and animations that supplement the chapter, transcripts of interviews with five experts featured in the video, and a glossary and bibliography. The video and textbook chapter cover two main phenomena of emerging diseases - evolution of antibiotic resistance, and mutation of disease organisms due to novel environmental pressures. There are detailed explanations of microbial evolution by mutation and acquisition of new genetic material, as well as case studies of infectious diseases spread by animals. The course outline provides a structure for incorporating the video, the textbook chapter, and five classroom activities into a 2.5hr session appropriate for high school or undergraduate students.